While Disney does have some non-Disney owned hotels on-site, most are owned, run and maintained by Disney. Unlike Disney, all of Universal's hotels are owned by the Loews hotel chain, who represent the high-end luxury brand in almost any city they have a presence in. Universal Orlando's hotels are no different. Even the "low-end" hotel on property, the Royal Pacific Resort, can compete with any "low-end" deluxe hotel on Disney's property. In this respect, UO is more like Disneyland, leaving the cheaper "partner" hotels off-site but nearby. The "Partner" hotels don't afford you front-of-line privileges, though. Oh, those front-of-line privileges. Universal's version of a Fast-Pass is Universal Express. If you stay in any of the three on-site hotels, you get unlimited access to the Universal Express lines. No (or very little) waiting. This isn't as important in say, early December, but during the crowded summer months, it's great. 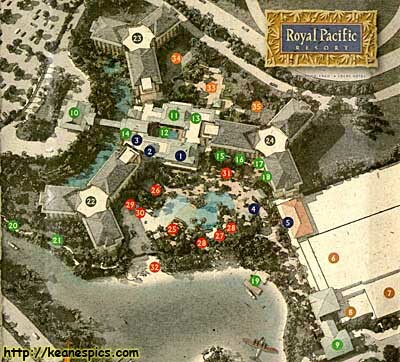 Royal Pacific Resort is the newest hotel on Universal's property, completed in 2002. 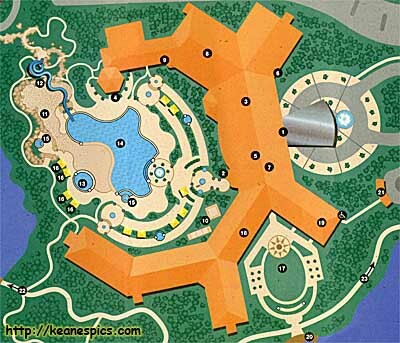 (When I was there in 2002, however, they were still working on the convention center part of the hotel.) This is a large place, with a 1000 rooms, and the "cheapest" of the three Lowes hotels on property. I also stayed here in 2003, 2006 and 2008. I don't have any interior pictures, but they put in this interesting feature in the rooms. The wall by the bathroom angles out, so if you're in bed watching TV, the room has a distorted perspective, and looks and feels much larger than it really is. I'm surprised I haven't seen that in more places. 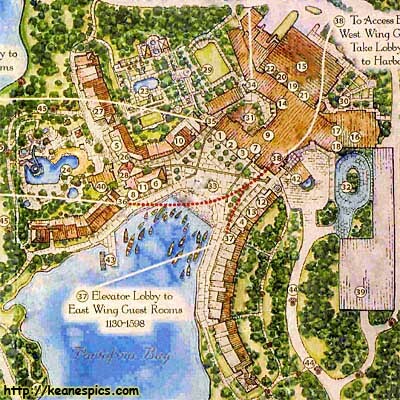 In 2007, I stayed at the Portofino Bay Hotel. 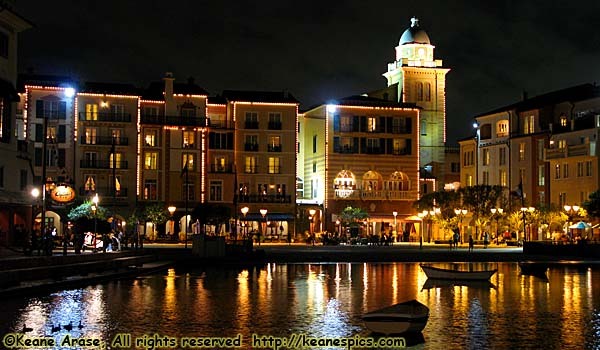 The Portofino Bay Hotel is a nice place. A very nice place. But probably too nice of a place for someone like me, who can have just a nice of a time at a place that costs $150 less per night. One of the major complaints I had about the place, was the bay area. During the day, it is plainly visible that all the relief and detail on the building is painted on. It makes the entire place look pretty cheesy. It does look better at night, but then you get to see all the light bulbs that are burned out.